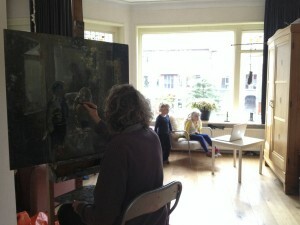 Setting up a large children’s portrait. Besides interiors and landscapes, I’m simultaneously working on several children’s portraits. Meanwhile, my new website is progressing. When ready, there will be many new works (that are now in progress) on it…! My studio is vibrating with lots of works in progress that will be published when the new website will be released. More soon. On this blog you can follow works in progress.